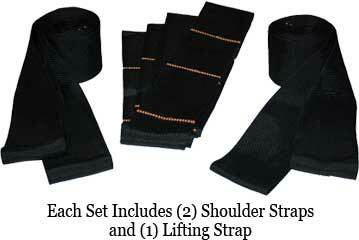 TeamStrap ® is a two-man adjustable appliance and furniture moving harness. 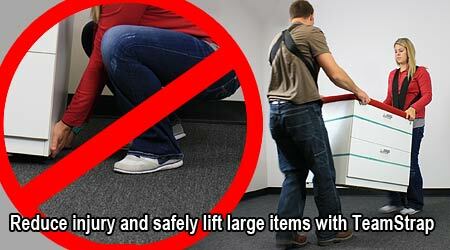 Its patent-pending design allows it to support up to 650 lbs safely. The harness allows each lifter to easily maintain proper posture ensuring that almost no stress is placed on the lower back, which is where virtually all back injuries from lifting occur. Because your hands are no longer needed in order to lift and support the object being carried, they're free to focus exclusively on the simple, effortless task of maintaining balance. The lifting of the object is performed almost exclusively by the legs. And the supporting of the object is handled entirely by the moving strap. TeamStrap consists of two lifting harnesses that go around the shoulders and one adjustable lifting strap that supports the piece of furniture being moved. The TeamStrap appliance moving harness makes carrying large, hard-to-handle furniture a piece of cake. Easily move furniture and appliances around corners, up and down stairs, and through tight spaces.